(Bloomberg) -- The extent to which corporate buybacks have driven this year’s U.S. equity rally is up for debate. What’s more certain is the trajectory of that demand. In short, it isn’t encouraging. At the Bank of America unit that executes buybacks for clients, orders over the last four weeks just fell from the year-ago period for the first time since 2017. With the first-quarter earnings season set to get going next month, BofA’s strategists warned that the slowdown is likely to persist. That’s because corporate America is stuck on the sidelines in order to comply with regulations under which companies refrain from discretionary stock buybacks for about five weeks before reporting results through the 48 hours that follow. 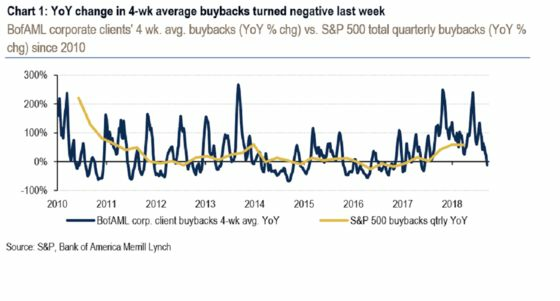 “Seasonality suggests buybacks should continue to slow over the next several weeks, before picking up in mid-April during 1Q earnings,” strategists led by Jill Carey Hill and Savita Subramanian wrote in a note to clients. 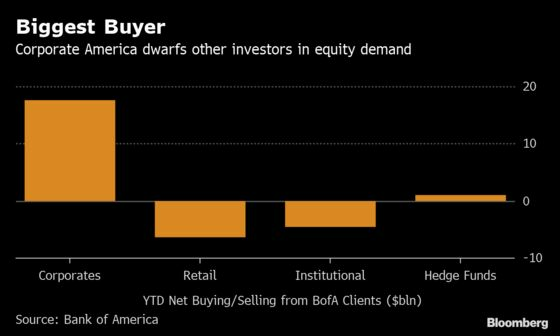 Buybacks have gained traction in recent years, with corporate appetite dwarfing all other investors as the biggest source of demand for U.S. stocks. Net purchases from corporations totaled $1.6 trillion during the past three years while investors from pensions to mutual funds to individuals were sellers, according to data from Goldman Sachs. That pattern appears to be showing again this year, at least going by BofA’s client flows. At $17.6 billion, corporate buybacks are 18 times as much as the total buying from hedge funds, the only other client group that’s bullish on stocks. To be sure, the pace of buybacks is likely to pick up after earnings. In fact, Goldman Sachs strategists led by David Kostin expect repurchases from S&P 500 companies to rise 22 percent this year to a record $940 billion. Still, the earnings-related buyback blackout is one reason strategists such as Charlie McElligott at Nomura cautioned investors to watch out for a market decline after the S&P 500’s 20 percent rally from its December low. The next month is “the window for the U.S. equities pullback as supply/demand would shift,” McElligott wrote in a note. Other catalysts include quarter-end selling due to pension fund rebalancing and a pickup in Federal Reserve balance sheet runoff in the final two weeks of this month, he said.